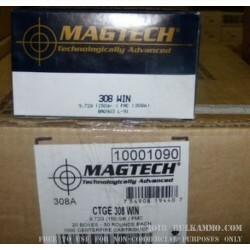 An excellent all around .308 range ammunition at an excellent price. 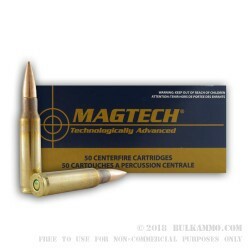 This MagTech .308 Winchester in a 150 grain Boat Tail Full Metal Jacket loadout is a great choice for general shooting purposes. It is plenty accurate for open sights and can hold 1-2” groups at 100 yards generally. At the price point this is a perfect candidate for your steel target outings. 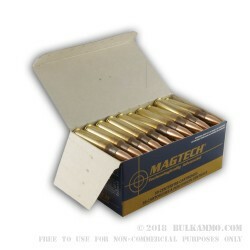 Made specifically to cater to the overpriced market in .308 Winchester ammunition, this ammo isn’t going to have the same consistent velocities that you find in a premium build, but it is priced for the other end of the market. Most shooters who appreciate the price point and realize that they are getting an excellent product reliability wise, will be able to justify slightly less accuracy at more than 150 yards than the premium lines. Make no mistake: this is a very good cartridge and is useable in every .308 there is, which is more than can be said for some of the premium loads, with their finicky tolerances at times. One can generally expect to see about 2800 (fps) muzzle velocity and about 2600 ft. lbs. of energy delivered at the muzzle and a highly functional round with good ignition and relatively clean powder burn: more than you can get form most bargain loads.